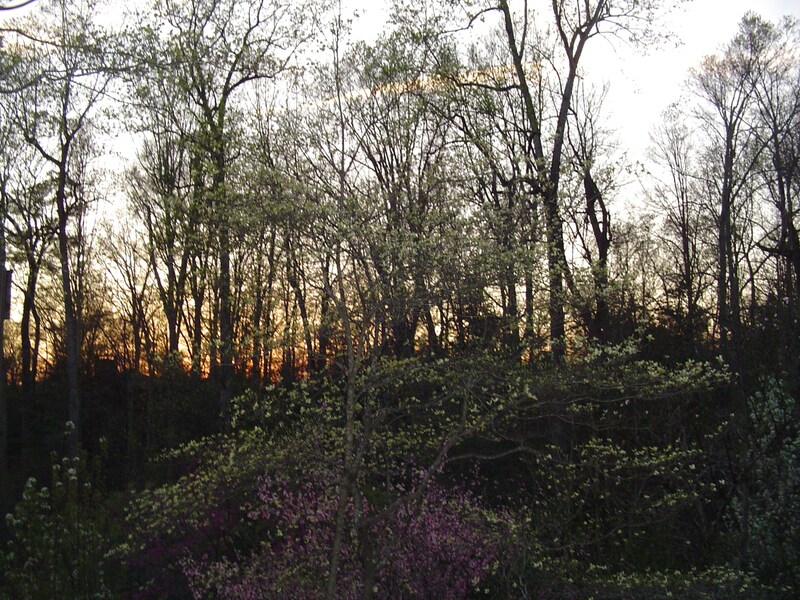 When you’re ready to plant new trees in your garden, how do you choose which kind? Most plant catalogs give so little information to help you choose, and their photos are often tiny. A new tree likely will still be growing in your garden long after you’ve moved on, so it’s important to make a wise selection. Like choosing a mate, sometimes it’s just a matter of falling in love with a particular plant. We fall in love with a beautiful Magnolia, which unfolds its delicate flowers in earliest spring, and just want one growing in our garden. It always pays to look a little beyond love at first sight when making a life-long selection, as most of us have learned by now. So let me share a few thoughts on how to choose a tree, with which you will fall in love, and also to make a few suggestions for those whose gardens are similar to ours. Mountain Laurel, a small evergreen tree, blooms each May. Since every part of it is poisonous, deer leave it alone. Dogwood to the left just finished blooming in April. My neighbors and I have lately developed a “love hate” relationship with our trees. Let me rephrase that for clarity: a “love-fear” relationship. We love our trees. Most of us chose this neighborhood because we love the heavily wooded, shady, beauty of our community. And yet, we’ve all had fallen trees on our own or a neighbor’s property, and seen our roads blocked and property damaged from storms destroying our trees over the last few years. We’ve seen how the huge old oaks and beech trees we love all summer for their shade can blow over in an instant during strong storms. There have been only a few, rare days over the past seven months when we haven’t listened to chainsaws, grinders, blowers, and heavy trucks in our neighborhood as storm damage is cleaned up and tree trimming and removal continues. We’ve all looked up into the canopies surrounding our homes, wondering which trees are vulnerable in the next high wind. We’ve looked for dead limbs, leaning trees, and thick canopies which need pruning to survive. So the first criteria for any new tree we plant is its mature height. When you know how tall a tree will grow over the next 20 to 50 years, you know how far to plant it away from your home. Now, most of us have old trees in our yards which were growing here when the lots were cleared for our homes. The builders left them, and we’ve loved them all these years. These are the old oaks, poplars, beech trees and pines falling all around the Williamsburg area. Any tree planted within 100’ of a home should have a mature height of less than 100’. Many of our native hardwood trees reach that height, and more. So we need to check the height of any new tree, and plant it a minimum of that distance away from our roof and driveway. Most of our trees grew here long before the houses were built, and tower over 100′ in their maturity. A second criterion is what material the tree will annually drop, and where that will fall. Have you ever lived near a mulberry tree? I love mulberries, and they are beautiful trees. Birds love them, too, and sit in their branches gorging on mulberries for several weeks each summer. You know what happens next, don’t you? White pine trees not only drop their needles each year, but also pine cones and dead branches. Our native pines grow quite tall, and suffer frequent wind damage. One always watches the nearby pines swaying in a heavy storm. I’ve spent many hours at a previous property picking up cones and raking needles to use as mulch. It is a constant responsibility, and an expensive project to have them trimmed or removed. Some trees, like Bradford pears, bloom beautifully in early spring, but have weak wood. They drop branches, they split, and they develop disease. Once a popular landscaping tree, like the Lombardy Poplar, many have found they are problematic as they age, and have them removed. Any fruit or nut producing tree will also present a challenge. One must properly care for the tree and harvest the produce, or be ready to clean up spoiled fruit which falls. Our garden is filled with fruit and nut trees, and yet we don’t get most of the harvest. Who does? The squirrels, who can get through any net, and will strip the tree of peaches and apples before they can ripen. American Holly surrounded by white pines. Another concern in our neighborhood is the hungry herd of deer, who graze on certain trees and shrubs. Although we have a list of deer resistant plants which grow in our area, the deer don’t always read the list or heed it. It is hard to protect certain new plants, even with cages, fences, sprays and any other repellant you can think to try. We certainly don’t want to plant a tree they like, which will draw them in even more. 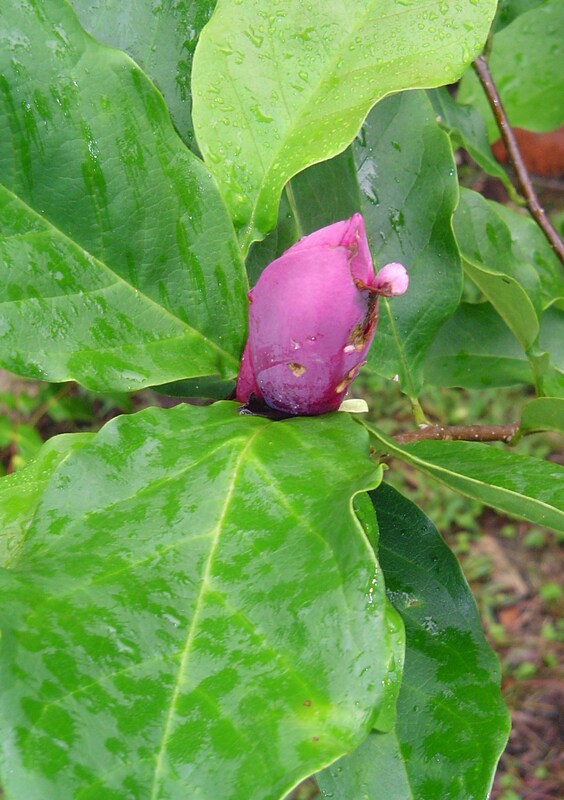 Magnolia, one of the earliest trees to bloom, is rarely touched by deer. An early bloomer in March, this tree gave us bloom again in late summer. Finally, choose a tree for its beauty. Whether you want something evergreen, or a tree which transforms with the seasons, choose a tree which you find beautiful. I love trees which bloom, and later have beautiful fall color. Some trees have beautiful bark and branches; others have intricate bright leaves all season. Every tree has some value for wildlife. It provides shelter, harbors insects the birds will eat, provides spots for nesting, and usually has some sort of berry or seed birds will eat. Many provide nectar in early spring for bees. Even so, I favor generally native or naturalized trees over exotics imported from Europe or Asia. Our native trees are uniquely suited to the vagaries of our climate and they already fit neatly into the forest ecosystem. 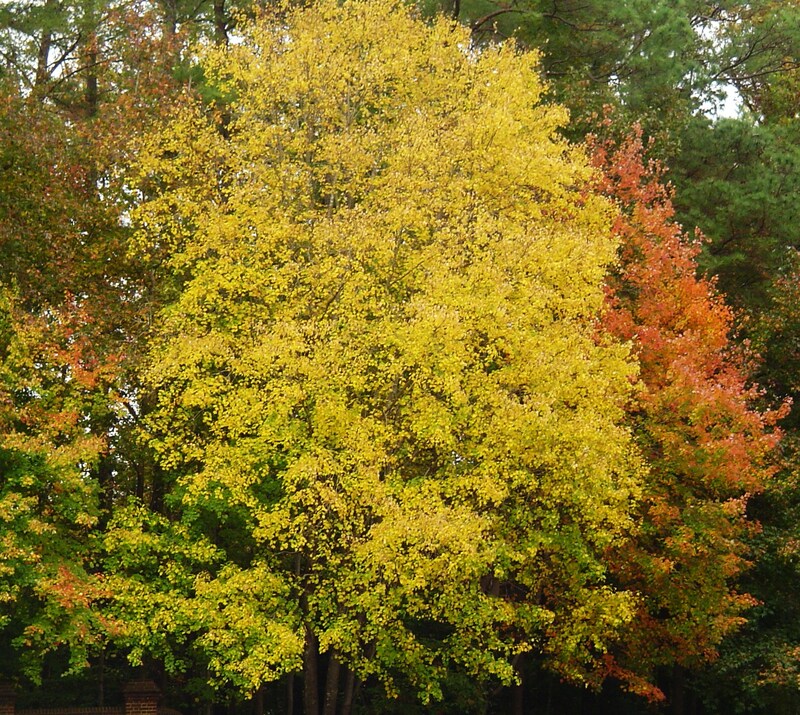 When choosing a tree, remember to consider its fall color and its winter bark and form. Spring blooms are nice, but fall color finishes the season so beautifully. Dogwood Cornus florida This beautiful understory tree thrives in sun to partial shade, and is beautiful every day of the year. White or pink flowers in April are followed by attractive leaves which turn scarlet in autumn. Scarlet berries follow the flowers, and winter branches hold the buds for next spring’s flowers. Graceful and strong, these trees only reach 20’-30’ tall. Native to Virginia, they manage to survive any grazing deer and have adjusted to our soil and climate. 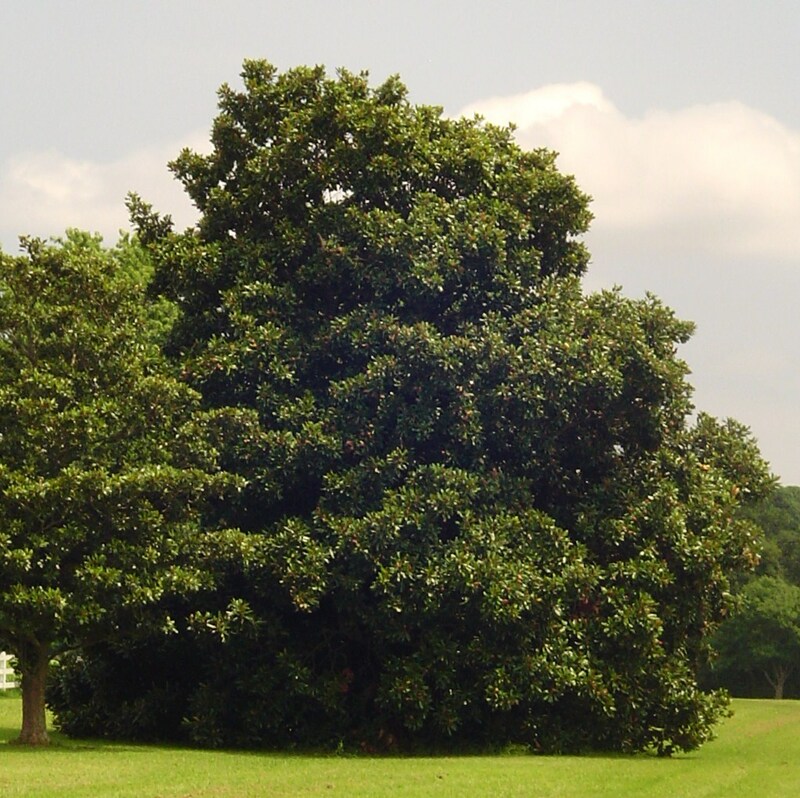 Magnolia grandiflora This huge, glorious, evergreen tree simply shines every day of the year. Its large oval leaves are glossy green, and its large white lotus-like blossoms perfume the summer air from May on. Another native, a Magnolia demands space. It can dominate a yard as it spreads its long branches to cover a space 30’ to 40’ across. It may eventually reach a height of 90’ or more. This is an exceptionally strong tree, wonderful for children to climb, and rarely seen blown over in our summer winds. Figs are the only fruit tree on my short list, because they are beautiful, andthe fruit is able to ripen without getting eaten by the squirrels or deer. Deciduous Magnolia species. There are many other species of Magnolia which bloom in early spring before their leaves unfurl. Most of these species originated in Asia. Magnolia soulangiana, or tulip Magnolia, blooms in shades of pink, purple, white and yellow. This is one of the most beautiful trees in the spring garden, and one of the earliest to bloom. Trees are very graceful, with beautiful bark and branches. They rarely grow over 30’. 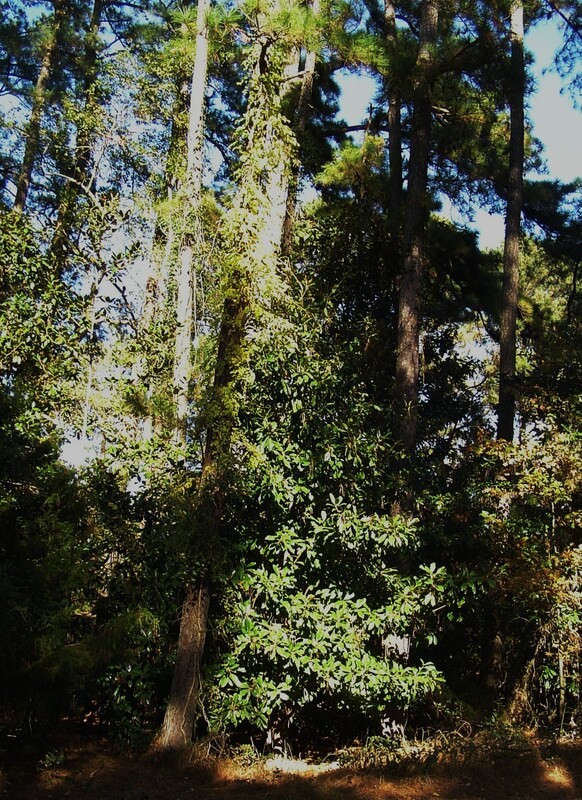 A young Magnolia grandiflora grows in the shade of pines. Holly Our native holly, Ilex opaca, is one of many beautiful evergreen hollies which grow well in our gardens. Although deer have grazed hybrid holly plants just home from the nursery, the native holly survives the deer. Beautiful red berries cover the female plants all winter. If planting, make sure to purchase at least one male holly plant for every 5 to 6 female plants. Rare specimens will eventually grow to more than 40’ or so, with a spread of around 20’. Another understory tree, holly prefers full sun, but can grow in partial shade. Live Oak Quercus virginiana The live oak, another graceful, spreading, evergreen tree; is known for its enormously strong wood. At one time, the US Navy maintained oak forests to produce wood for ships. These lovely oaks will reach maybe 60’ over many years, in exceptionally good growing conditions. But live oaks usually grow wider than they are tall. Their branches often droop down to nearly touch the ground before growing up towards the sky again. It is extremely rare for a live oak, one of the strongest trees, to suffer wind damage unless hit by a tornado. These trees host many other species of plant along their branches, to include mosses, ferns, and ivy. They provide shelter for wildlife and produce acorns each autumn. There are over 90 species of oak native to the United States. Most will reach 60’-80’, or more. As much as I love oak trees, all four of the trees we’ve had fall, destroying other trees as they fell, were oaks. Most species grow very tall and develop thick canopies each summer, which can catch a strong wind like a sail. When they fall in a storm, a huge portion of roots is also torn out of the ground, leaving a huge, deep hole, with roots 12′-15′ up in the air. For these reasons, I’d be very cautious about planting an oak, and make sure it was planted far enough from the house to not hit if it falls 50 years from now. Birch Birch trees, small to medium sized with beautiful bark, are native to many different temperate regions around the planet. There are some native birch species, but many imports from Europe and Asia naturalize easily. Strong wood, graceful habit, and good fall color make these a beautiful choice. Maple There are hundreds of varieties of maple, native to many temperate regions around the planet. Although some species grow quite large, many smaller, and even dwarf species are on the market. Maples are known for their beautiful foliage. Many Asian species have red, purple, or even variegated leaves all summer. Maples are deciduous, have love bark, and are very healthy trees. 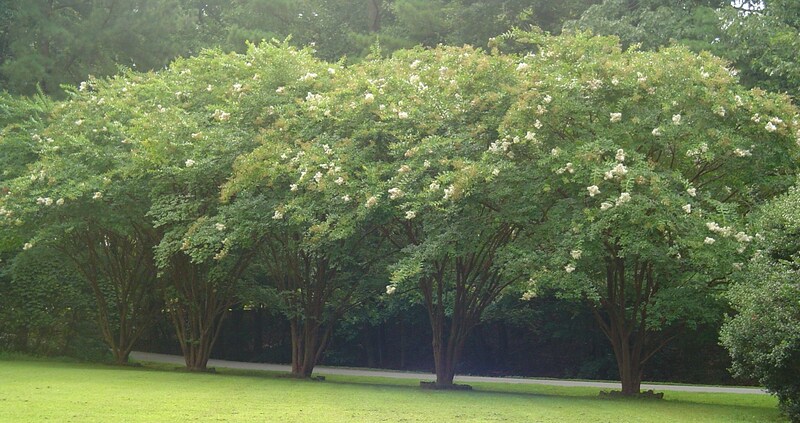 White Crepe Myrtles bloom from July through September. They rarely suffer any damage from wind or grazing deer. Crepe Myrtle, Lagerstroemia indica, though not native in Virginia, have naturalized here easily. These beautiful trees cover themselves in flowers from early July to September. 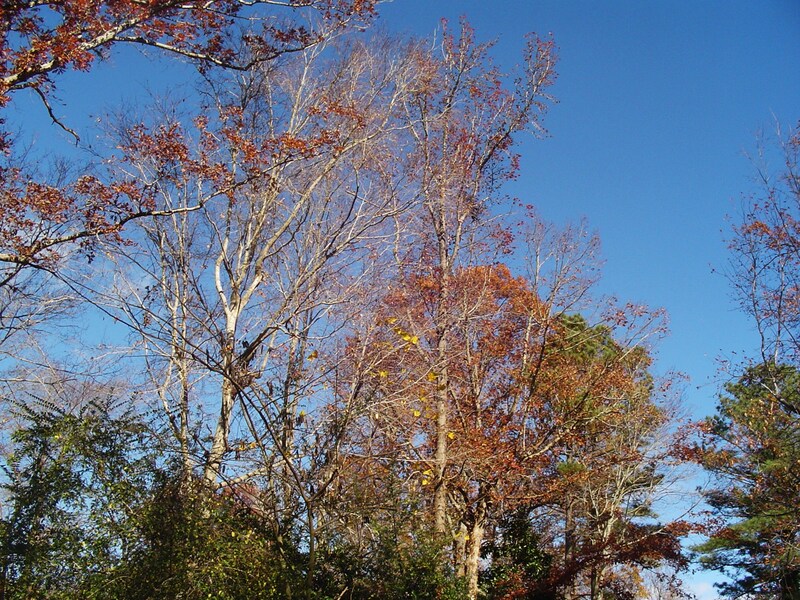 Generally small trees, they have beautiful bark, fall color, and rarely suffer damage in the wind. Mountain Laurel Kalmia latifolia is really more shrub than tree. Rarely will it grow beyond 12’ high in our area. Evergreen, with beautiful flowers in early summer, it grows in dense clumps, often on hillsides and along riverbanks. 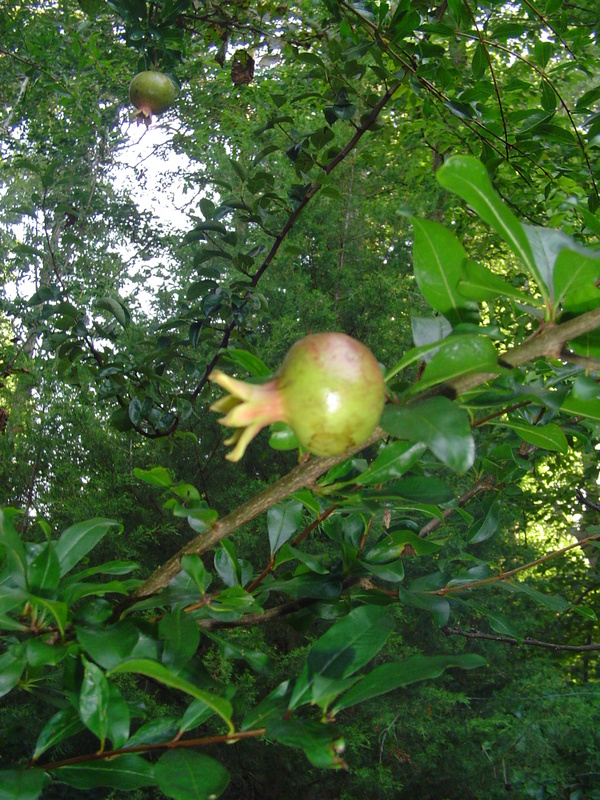 Native to Virginia, it is never grazed by the deer because it is poisonous. All parts of this lovely shrub with its twisted trunks and branches are poisonous. 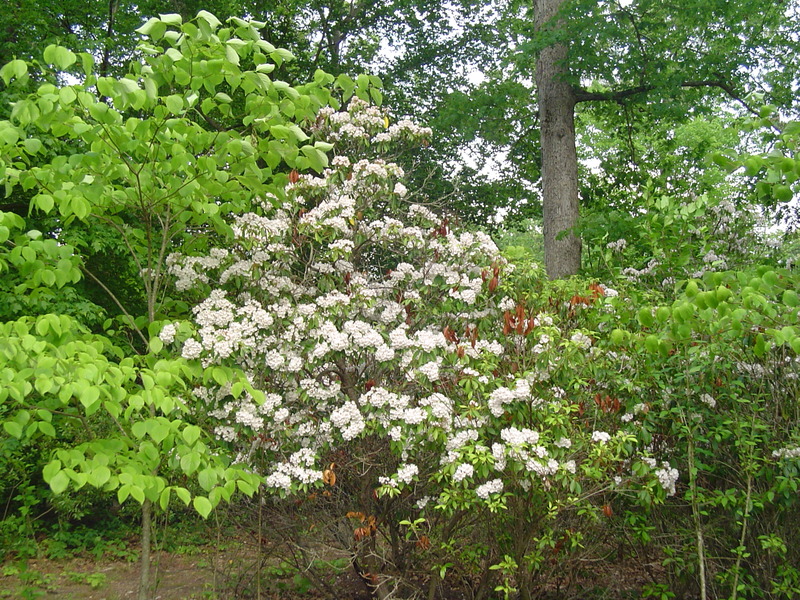 It is a good alternative here to Azaleas, which the deer devour. 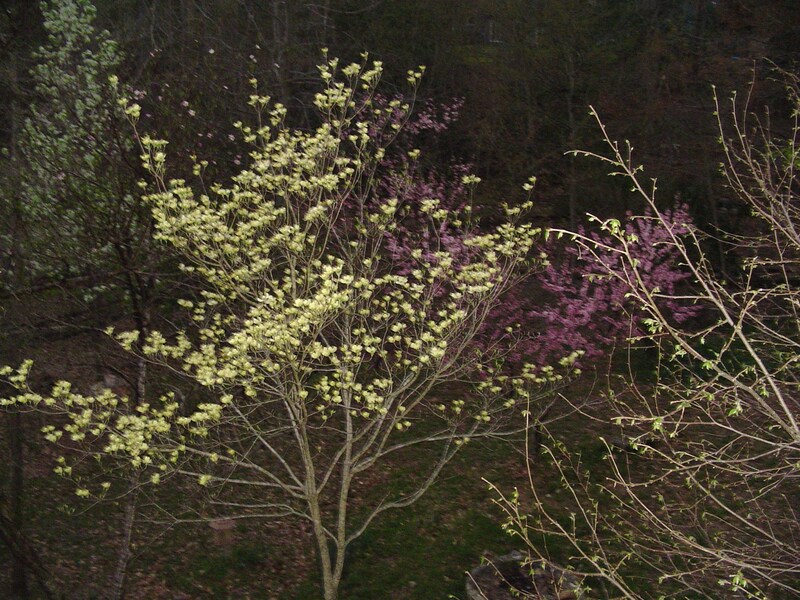 The Eastern Red Bud tree is a bright addition to the early spring garden. These long-lived trees bloom with the early daffodils. Fig Ficus cariga The one fruit bearing tree which makes it to my list is the fig. Most of my fig trees produce green or golden fruit, which generally survive to ripen, and for us to pick and enjoy. 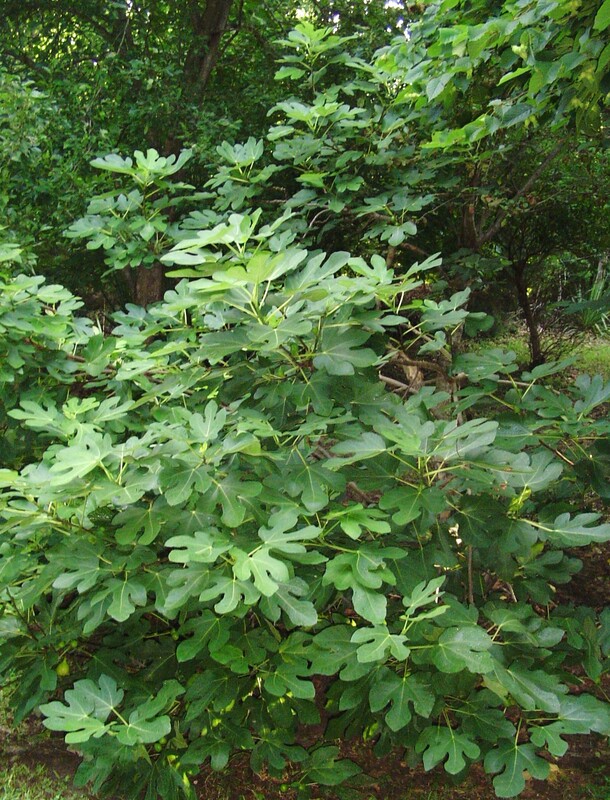 The figs don’t fall on the ground or attract insects, and are rarely bothered by deer or squirrels. Fig trees tend to grow broad and stand up to the wind fairly well. Huge, beautiful leaves cover the fig all summer, and its form is beautiful when the leaves have dropped. Many different species, with different colors of fruit and overall tree size are available. Figs can be grown in large pots or in the ground, and most are hardy in our climate. Pomegranate ripening. Not on my list of 10, but a good tree in our garden. 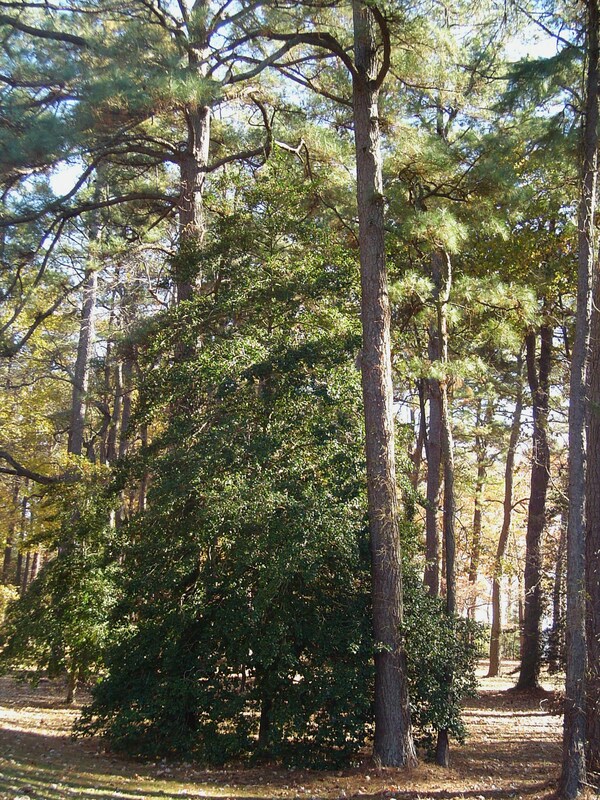 So here is my personal list of ten trees I would choose to plant, knowing what I know now about this acre garden in coastal Virginia. If I had to whittle this list down to one tree to recommend to anyone in my neighborhood, it would be our native Dogwood. Small enough to fit any of our yards, it can tolerate shade and still bloom each spring. 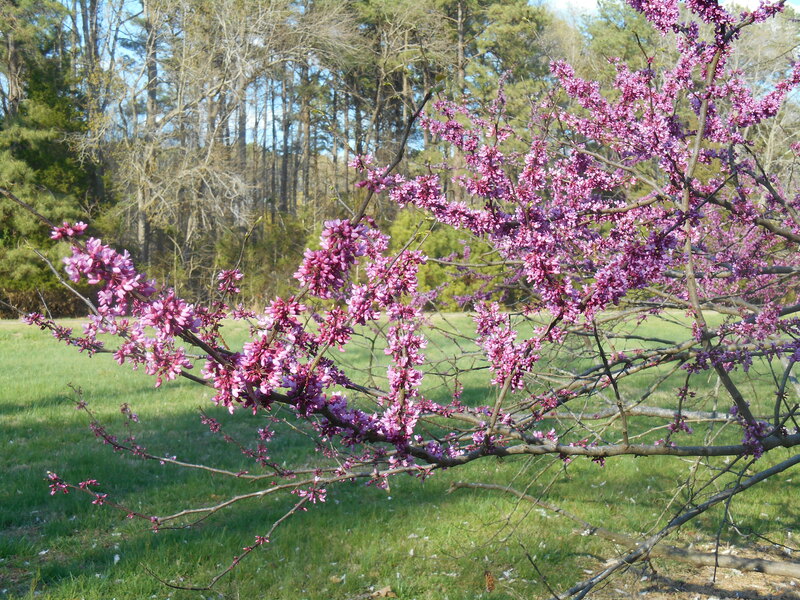 Neat, strong, hardy, and beautiful throughout the year, it is the state tree of Virginia. 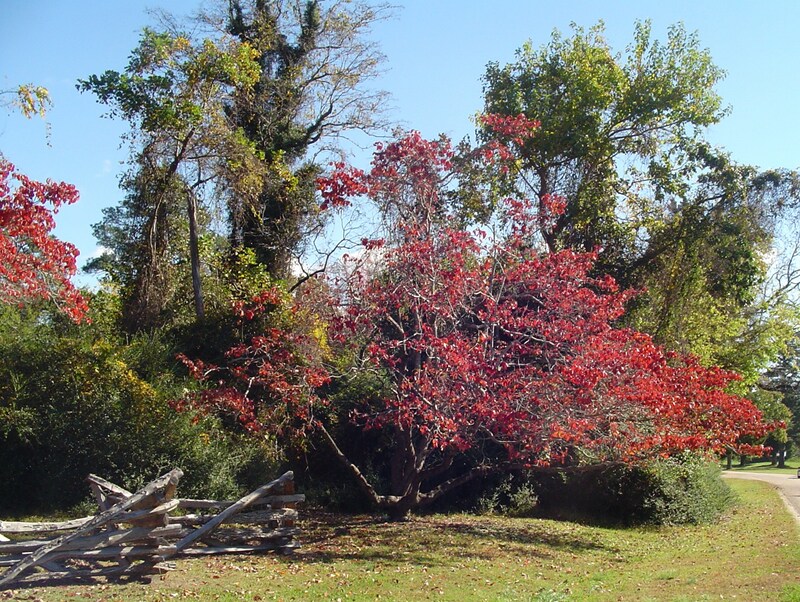 Dogwood leaves and berries turn crimson in Autumn. This photo from the first week of November. I hope you are looking at your garden, and thinking about whether you will plant a new tree this year. A gift yourself, a gift to your garden, and a gift to the planet; I know of no greater gesture of optimism and love. Which beautiful trees will plant in your garden this spring? Very nice article on choosing trees. When choosing a tree, I have one other criteria- is it something I am allergic to? Although I can not do anything about what a breeze brings from a neighbor’s yard, at least I don’t have to add pollen that I am allergic to. For native trees, you might considered the Fringe Tree (Chionanthus virginicus) which is a small flowering tree with fragrant blooms that remind me of warm honey. You want to choose a male as they are the ones with the prolific blooms. 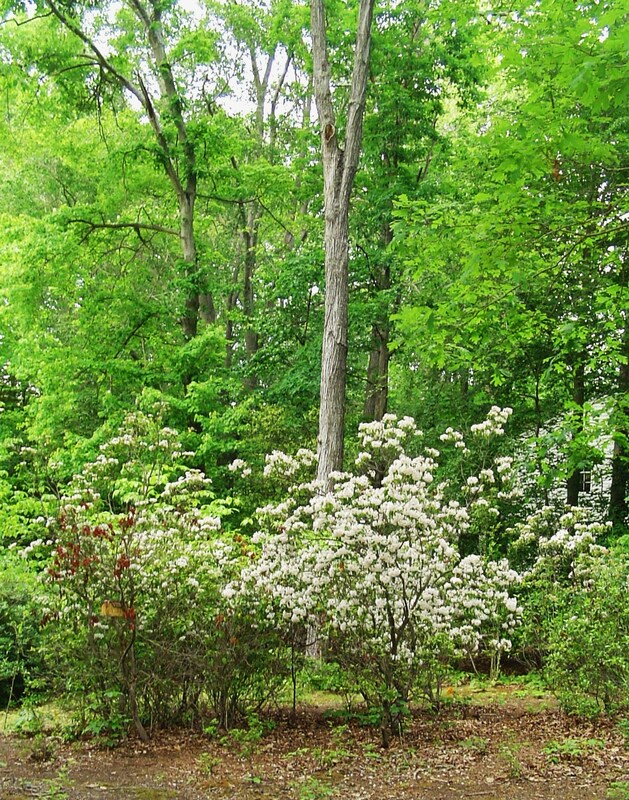 The fringe tree is multi trunked and is shrub-like in its shape. Also, the Paw Paw tree is another native but bears edible fruit that has a unique flavor and a custardy texture. It is also a small, nicely formed tree. We never pruned the tree and it always had a lovely shape. Although it does drop fruit, I believe it is worth having. I have never seen deer go after either tree, but that does not mean they won’t.